The season is in full swing, here at Fish in a Barrel Pond, and lots of folks are up, celebrating Memorial Day by doing a little fishing. There was a time, though, when we were at war and there wasn’t a whole lot of fishing going on. In an effort to keep our hopes up during World War II, the state of Pennsylvania continued with its stocking programs, looking ahead to the promise of peace. Many American companies switched to the manufacture of goods for the war effort, using all the expertise they had to support the fight for freedom around the world. 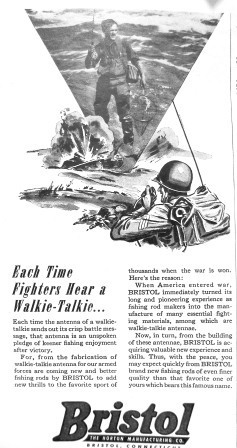 Companies like Bristol brought their own experience to the war effort and gained even more, anticipating better rods built using their new experience with walkie-talkie antennae. 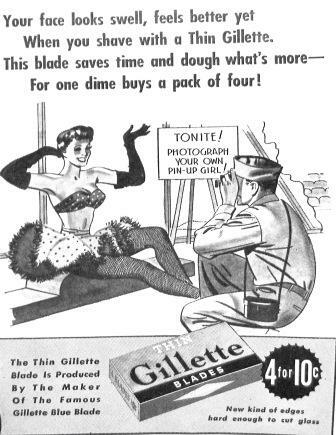 Gillette learned how to make blades thinner, helping enlisted men look good when their personal pin-up girls came to camp while at the same time appealing to cheapskates back home. The copy of this ad also refers to something that could cut glass. 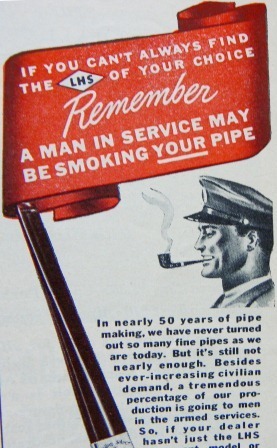 Pipe smokers gladly settled for less than the best, knowing our boys in uniform were puffing on quality smoking instruments. 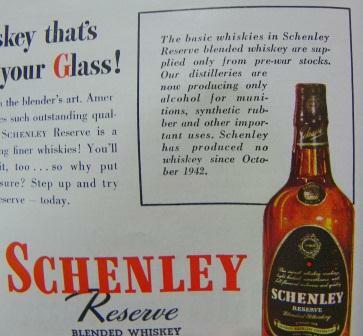 Even whiskey drinkers were content with pre-war stock as distilleries switched over to producing high-test, munitions-grade alcohol. In some parts of the country, people have been making high-test, munitions-grade alcohol for generations. It is called moonshine. 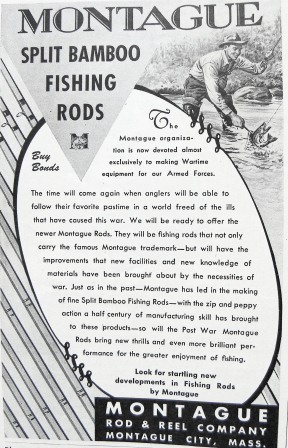 The Montague Rod & Reel Company advised anglers to “look for startling new developments in Fishing Rods” brought about by the “necessities of war.” So why do people keep telling me to stay way the heck away from Montague Rods? Woods Manufacturing kept everyone warm through the “grim days of war,” a welcome companion in the out-of-doors. 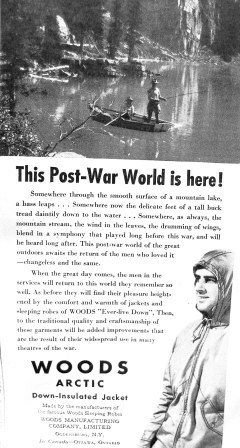 The ad above appeared in the July issue of Outdoor Life and they got through the hard times with the rest of us, proclaiming the wonders of a new post-war world two months later in the pages of Field & Stream. 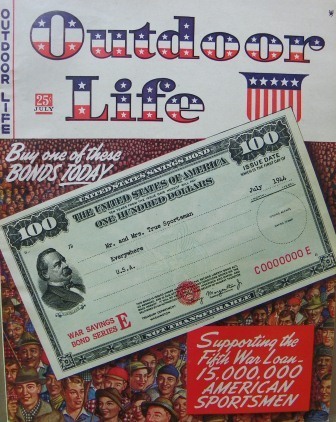 Outdoors-minded people helped out, too, during World War II, giving something they didn’t have much of at all back then, what with the recent Great Depression and all — money — as millions of sportsmen and sportswomen bought bonds, funding the war with what was in their own pockets. Outdoorsy people have always been willing to do whatever it takes, but while rods and razors, whiskies and pipes, big bass and warm jackets are still important to a fellow who spends his time outside, shortages and lesser quality are a small price to pay in times of war. Too many others have paid the dearest price of all. To all who have served, are serving or will serve in the American Armed Forces, thank you. I have a rod in my collection that is supposedly made out of a surplus WWII Jeep antenna. I should go use it on Monday, then put it back on display. Some of the finest writing as usual. I love the old ads!